The past week I was spending some time working on my all forgotten The Splendid Sampler quilt. At the time of the sew along, I only managed to sew 25 blocks and then I fell badly behind. I was trying to catch up and luckily printed out a few blocks, but then I gave up. Why? Well, because I realised that I did not like it and simply could not keep up with the deadlines. It caused a lot of anxiety and was making me feel irritated. Three blocks a week for me personally was too many because of my already limited sewing time and if I kept working on this quilt only, everything else would have been left out for a long time, but I wanted to keep sewing my own things and at my own pace and in a happy mood. Another reason this project did not work for me at that time was because of my poor planning skills. From the beginning I was trying to work only with the fabrics in my stash, without buying any extras and using the least precious prints, but it turned out more challenging than I thought at first. I kept gravitating to pinks and a tiny touch of blues. I also was a bit disappointed that I used some of the prints that I did not like very much for those beautiful blocks, but I had no time to redo them. I wish I had a more clear idea of what I wanted my finished quilt to look like - just a mix of pretty colours and prints or maybe one particular gamma. If I was doing it now, my colour scheme would be a bit different and I would only stick to prints I truly like. That's another important lesson to be learnt here - planning is essential, especially with large projects that are harder to fix. After falling in love with this project at the beginning and then almost getting to the point of hating it, I have finally pulled all the blocks out and I am happy to say that I love each and every one of them. I am determined to finish this quilt with an addition of five more blocks. When I look at all these blocks together, I do not really remember being frustrated or hating it at all. All I see is a lot of work put together by the wonderful designers who created these blocks. I see the love and deep meaning behind them, and stories and heartwarming memories of me working on these blocks while looking after my Little Boy. These are the four extra blocks that I have made and I am still working on the last one. This is a block called "Lina's Gift" designed by Pat Sloan. It's quite a lovely and simple block that can be put together with a wide range of prints. "Scrappy Happy Heart" is designed by Christa Watson and it is a lot of fun to sew. 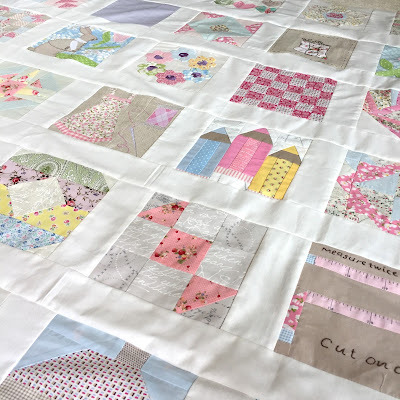 It's a perfect block for those tiny scraps all of us have aplenty. "Hand in Hand" block by Kari Carr. Oh, how I love this block! This block has a very sentimental meaning that I can relate to. I did not read the sewing instructions before starting the work on this block and was surprised how these triangles were done - stitched in and folded instead of just sewing it in. Pretty much like origami. One day I would love to make an entire quilt using just this one block in different combinations. Once again I am going to remind myself of these important notes to self (or anyone who might find them useful). 1. Starch, starch and more starch. Starch and iron the fabric before cutting and sewing, especially when working with small pieces. It makes work much easier and importantly it will shrink your fabric before you sew it. 2. Cut all the required block pieces before you start sewing. It helps to see how your block will look like and reduces a chance of any errors. Yes! I did cut just some part of blocks and then added more as I went. 3. Don't use pins when sewing small pieces together or invest in really thin pins that easily glide through layers of fabric and do not pull it. 4. Sew in batches or create a "production line" where possible to save the time and threads. Your quilt turned out absolutely lovely! I think those mistakes only stand out to the maker, all I see is heart stopping prettiness! You should be so proud of that quilt and all those"mistakes" are just learning opportunities.